A golden orb spider spins a web in space with NASA. Even NASA loves Spider-man, and it has a book about "spidernauts" to prove it. To mark the launch of "The Amazing Spider-Man 2" in theaters this week, NASA is touting "Spiders in Space," a free educational e-book touting the space agency's experiments to study how spiders react to weightlessness in space. The “Spiders in Space” teacher’s guide is available for free download at bioedonline.org. "Spiders and space are two things that capture the imagination of most kids, so it's a recipe for fascinating science in the schools," said Tara Ruttley, associate program scientist for the International Space Station, in a statement. Spiders have flown several times in space, but much of the book is based on spiders that launched into space in 2011 during NASA's STS-134 space shuttle mission. "I think this creates great memories for the students, and a way to show them how science can be fun as their science classes become more challenging through the years." Along with its seven-astronaut crew, the two spidernauts flown were observed to see how the creatures behaved in microgravity. The "golden orb" spiders (or Nephila clavipes) spun webs in a closed habitat for researchers to compare how those webs changed from on the ground. A female Nephila clavipes (golden orb spider) in her web. 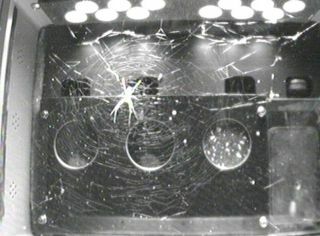 The zero-gravity spider webs looked a bit more circular than those on the ground, and the spiders spun their webs on a timetable – in contrast to another space experiment showing the spiders spun all day. Some school kids followed along with the spider webs' development and compared them to similar spiders living in habitats in their classrooms. Other partners on the book were BioServe Space Technologies and the Baylor College of Medicine. Besides STS-134, NASA stated, orb spiders flew to the Skylab space station in 1973 (the winning proposal from a high-school competition) and on shuttle mission STS-126 in 2008.